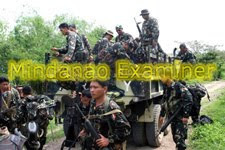 ZAMBOANGA CITY (Mindanao Examiner / Oct. 23, 2011) – Unidentified gunmen ambushed Sunday a military convoy killing two soldiers and wounding four others in Lanao del Norte province in the southern Philippines, officials said. Officials said the attack occurred at around 11:15 a.m. in the village of Payong in Sultan Naga Dimaporo town. An army commander, Lieutenant Colonel Bagnus Gaerlan, escaped unscathed from the ambush, but two of his soldiers were killed in the attack, said Army Lieutenant Colonel Randolph Cabangbang, a spokesman for the Western Mindanao Command. Gaerlan is the commander of the 5th Infantry Battalion. “The soldiers were heading to the town of Malabang when gunmen ambushed them,” Cabangbang told the Mindanao Examiner, adding the attackers retreated towards the town’s coastal area. No group claimed responsibility for the attack, but Muslim rebels are actively operating in the province. Just earlier on Sunday, armed men also ambushed a farm truck in Basilan province and killed 5 workers and wounded eight others in the village called Sapah Bulak in Sumisip town.